From the "Hills" of the Lowcountry comes a unique group of musicians called Low Country Boil lead by fiddle player Jevon Daly. Low Country Boil also composed of Guitar, Upright bass, and Banjo have been together 14 years and have tailored their music to what seems to work for their audiences. They have a great repertoire of Country Blue Grass songs like Rocky Top and songs from the movie"Oh Brother Where Art Thou" like Orange Blossom Special, Foggy Mountain Breakdown and Man of Constant Sorrow. The play Johnny Cash, Willie Nelson, Hank Williams Sr., The Beatles and some Neil Young. They can also add laid back rock. They also do some original songs about the area and are funny and involve the audience. Low Country Boil would be great for Country Hoe Downs, and Low Country Receptions, meeting the boat at Palmetto Bluff at Moreland Landing, a rehearsal dinner, a party at Honey Horn and any Hotel or Country Club special outdoor event. 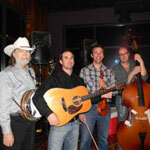 Whether playing bluegrass originals to old-time fiddle music to western swing, these guys are entertainers!! Low Country Boil was a big hit as well. I think our folks just enjoyed sitting and listening to them play under the moon and string lights! I would highly recommend them! Thank you again!